And a rainy one at that! Yuck! Where did the beautiful sun go??? I hope he comes back out soon! Yep, you've seen that color combination before! lol I really like it! With the dusty blue, deep raspberry, and the rich chocolate, it just looks so elegant and vintage. I can't think of a good name for it yet, but I have a few in mind. 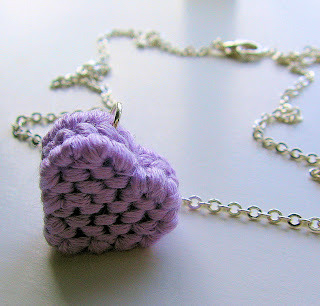 I'm going to list the necklace in my shop tomorrow morning, so I have to pick out a good name by then! If you have a name you'd like to suggest, I would love to hear it! I have been such a slacker this week! Well, as far as my shop goes anyway. But with good reason! I've been helping my SIL with her prom jewelry this week! And after several evenings of shopping for materials, and then another evening of actually putting the jewelry together, we finally got it all finished! And it turned out so beautiful! We did a gorgeous necklace, and a pair of earrings. The colors she chose are spring green and black. Her dress is a lovely little strapless number, and the necklace is going to look GREAT with it! The next time I'm over at their house, I'll be sure to get some pictures of it, because it is a beauty! 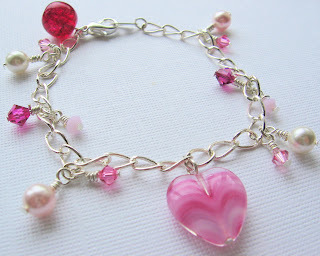 And today I did finally add a new bracelet to my shop! I just listed it a few minutes ago! I just love this one, too! 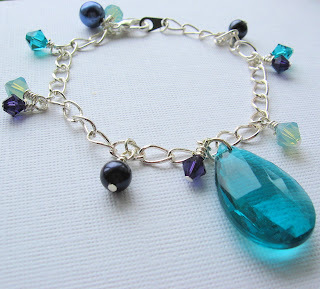 One of my favorite materials is Swarovski crystals; it's so fun doing the wire wrapping! I hope all of you are having a wonderful weekend as well! Happy Monday to you all! I hope everyone had a lovely weekend! I’m sure it went by too fast for you guys, too! 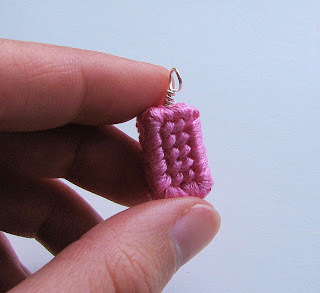 And… As I said, I’ve been experimenting… I really like the way the mini hand stitched food items look. 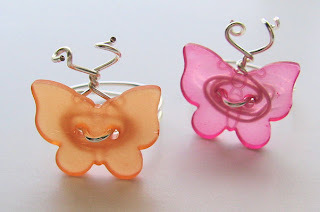 Very whimsical and fun, yet easily wearable! I don’t know what it is about the threads… They give the items a very unique, sort of quirky look. And I love the texture! I have plans for ice cream cones for summer, too! As well as some other seasonal treats. But you’ll just have to wait for those! If you have any suggestions, just let me know! I've been in the Strawberry Patch! Well... Not really, but it sure smells like it! And it is very special indeed! 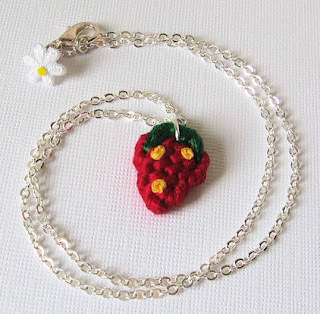 The inspiration for this creation is a memory I have of wandering in my neighbor's strawberry patch, back when I was just barely old enough to be in school! She gave me permission to 'test' as many strawberries as I needed! lol What fun I had going from row to row, trying to find the best section of juicy sweet strawberries! I'm so happy that I got this necklace finished. It was so much fun to make! I went through several different shapes and scents before I was happy with the finished product. And I also did several variations on the seeds as well. All in all, I am so happy with this necklace. I hope you guys enjoy it as much as I do! Last night my husband brought home some flowers and a watermelon for me. I can see you right now thinking, What's wrong with that? ...and one of the best watermelons I have ever eaten! I'm also excited to help my SIL design and create her jewelry for Prom. 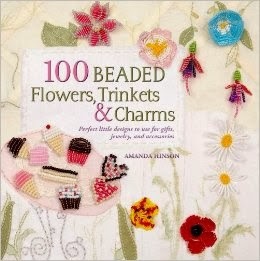 I'm really trying hard to get her into jewelry making, so I'll have someone to share the obsession with. ;) Her prom dress is my favorite shade of bubblegum pink, and it has little sparkles all over it. 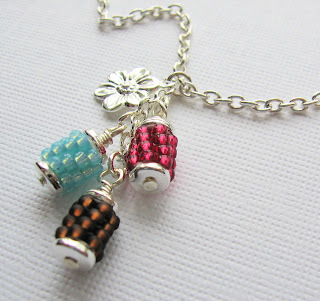 Her jewelry is going to be made with silver and black Swarovski crystals - so pretty with the pink dress! 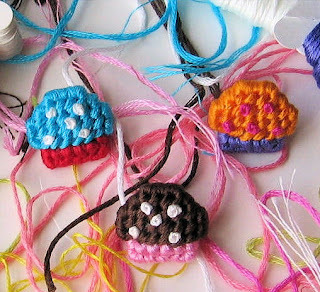 We've also talked about incorporating ribbons and pearls, too. It's a really fun process! This one is scented in Lavender Vanilla. You can purchase it here! And many more! I'm having a ball with these! 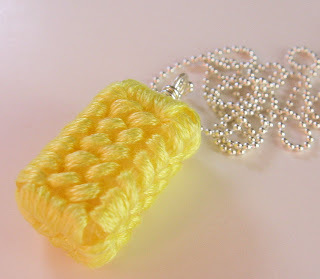 I just posted my first Scented Softie necklace in the spring line! I can't believe how it smells just like a lemon cupcake with loads of sweet lemon icing! I think I gain a few pounds every time I sniff it! lol You can find it here! And last, but certainly not least, I have some sweet new rings to post soon! 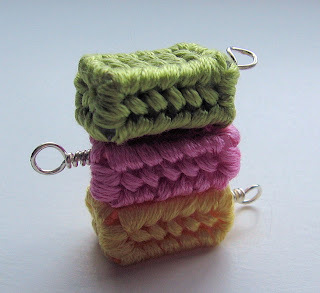 As soon as I get the Scented Softies Spring line completed, I will be posting more rings! I was just looking out the window, and it's so windy out there! But very sunny; I thought it was supposed to be nasty and rainy all day. How nice! I've also been playing around with some different designs, and a few little embellishments. Hehe! Sometimes I think that experimenting is the best part! lol Although I do like when I get the hang of something, and have a finished creation to admire, too! I suppose I just adore the whole process! And now I'm off to find some lunch! I hope you guys have had a wonderful week! I hope everyone had a wonderful weekend! Mine was nice and relaxing; as always, it went by way too fast! I did get a chance to work on some more jewelries for my shop! I call them Softies. lol Lately I've been playing around with different textures in my jewelry. I've found a lot of solid pieces with different textures, but I wanted something that was softer, more light and airy for spring and summer. Yet I can easily see these going into fall, with shades of red, orange, yellow, brown. And winter, with icy blues, white, and of course red and green. I would love to hear your ideas for colors and scents as well! I'm off to get some lunch before I go to work! I made this special Rainbow Fairy Lantern, and covered it in glitter! 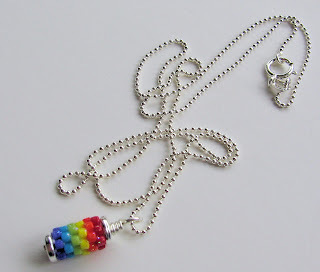 You can find this necklace and many more lovely glittered items by visiting Etsy, and searching for 'idolgivesback'. I'm quite excited about it! 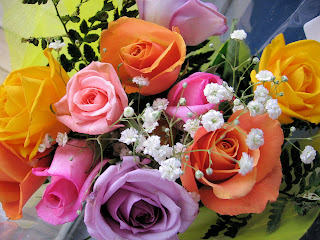 I hope you will stop by and check out all the beautiful things! As always, I hope everyone is having a wonderful day! Etsy Love and some Fairy Lanterns! 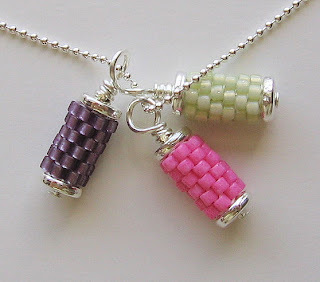 This is a picture of my new little Fairy Lantern Necklaces! 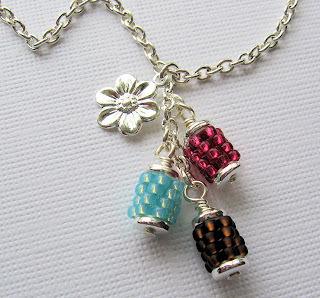 Well, actually this is a picture of three of the fairy lanterns on one necklace. 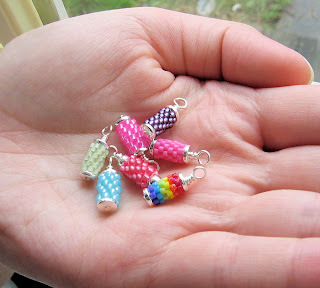 When they go up in my shop, it will be one Fairy Lantern on sterling silver ball chain. And don't be fooled by this picture; these little lanterns are tiny! The whole lantern measures right at 11/16" tall, including the wire-wrapped loop! See? Tiny! 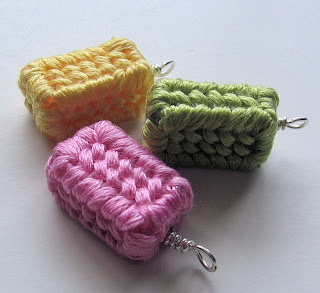 Look for them soon in my shop! I have to run to work now; I hope everyone is having a wonderful day!